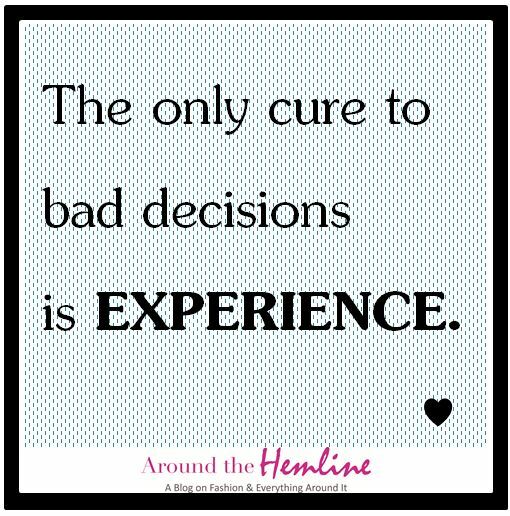 The only cure to bad decisions is EXPERIENCE. When we’re children we were told what not to do for our own safety. But as we get older, we make some bad decisions and curse ourselves to death for those decisions. But in all actuality, no one can prepare you for your own bad decisions, unless it’s yourself. Self-taught lessons are the best lessons you can get in life because you know right at that exact moment you make that decision, you know if it’s right or wrong to you. As many bad decisions I’ve made in my life, I look back and admit, “That was pretty stupid, I should have…” and go into all the shoulda coulda wouldas. But once I’m done crying a river about it, I think of the experience I’ve gained. Without bad decisions, life would be boring. If I didn’t make that bad decision, then the journey would have been a great story to tell later. It would go exactly the way you wanted but it brings you no merit of overcoming the obstacles you placed in front of you. I’ve made bad career decisions – “direct sales marketing”really meant you would be on foot going business-to-business knocking on doors selling whatever the promo item was for the day. That experience showed me the various way hiring managers will word an ad to be more intriguing that what it is and it made me do more research and filtering of applying to relevant jobs. I’ve made bad relationship decisions – that girl who called is your “sister,” right? I use to ignore the red flags because I always tried to see the best in people. As I’ve made several bad decisions, my judgement got better and I held onto my intuition tighter the next relationship. Those are just a few bad decisions among many I’ve made and I have yet to make. No is perfect so keep trying and don’t give up. Mistakes are experiences in disguise so play different roles in your life’s story. It can only bring maturity to future decisions. Have a great week!